I am not a vegan, and I don't really agree with those taking it on as a 'challenge' or 'diet'. The exception, is if it means individuals consume more whole-foods and less processed products. Tom Oliver Nutrition is all about this approach, and provide a nice range of vegan protein bars. The protein in these bars comes from soy protein, which is a good alternative for those that can't consume whey protein, and don't like the taste of casein or hemp. Slightly off-putting when initially looking at these bars, is that the most prominent ingredient is Maltitol - an alcohol sugar. Some research reveals that this is a safe and natural sweetener though, and a substitute for sugar in a lot of natural products. Further ingredients are Soy protein, organic cacao, natural oils, and fruit peel. All pretty natural. The Tom Oliver Vegan Protein Bars taste good, if a little dry in texture. My favourite was the Chocolate Caramel version, which has nibbed peanuts as a topping, helping to add a bit more texture. 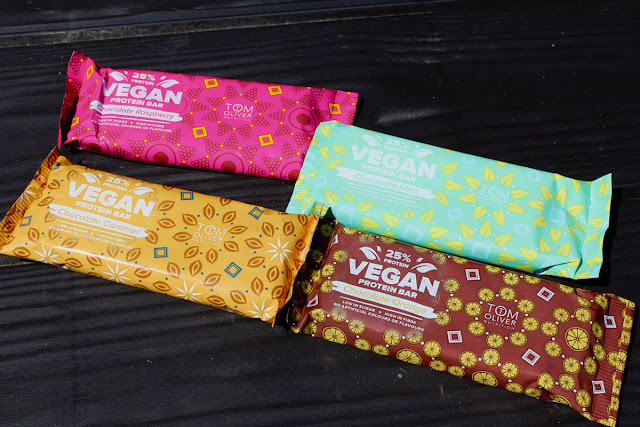 As a healthy, low-sugar, low-calorie, high-protein snack, the Tom Oliver Vegan Protein Bars are a nice product. Vegans can struggle to keep up their protein intake, so these could be a handy post workout product to kick-start recovery.